Boneless, skinless, chicken breasts tend to be a little bland. That's why I usually use a marinade of some sort when I'm working with these. The nice thing about marinated chicken breasts is that you can keep the fat content low (which is why most people opt for this cut) and impart some nice flavor to the chicken. Another option is to stuff your chicken breasts. You can get very creative going this route but with so many possibilities it's easy to lose site of the healthy aspect of the skiness chicken. Throwing caution (and calories) to the wind, I stuffed these with cheese and bacon. Some arugula was tossed in to ease the guilt. 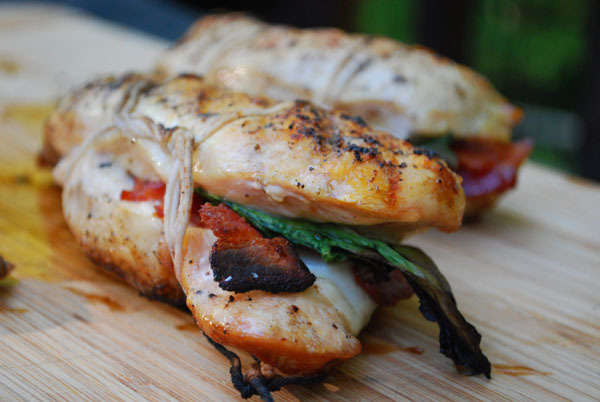 Using a sharp knife, slice your chicken breasts about 80% through so the top and bottom can act like bread slices in this bacon-fontina-arugula sandwich. In each, layer in first 1/3 of the cheese, 1/3 of the bacon, then 3 of the arugula leaves. Using butchers twine, tie them up well so they won't come apart on the grill. Season well with salt and pepper on both sites. Grill the chicken breasts over direct-high heat for about 2 minutes per side. Then move the breasts to indirect heat and cover the grill. Continue to cook until the chicken is cooked through, about 15 minutes. Slice and serve with an arugula-pesto for dipping (follow this pesto recipe and just replace the basil with fresh arugula). Nice one! I'm not a chicken breast fan but these look good. Mind you, anything with rocket (arugula) pesto is a winner in my house!